Most cats, even those who have spent a lot of time outdoors, can transition to indoor life as long as you take care to give them lots of attention and things to do. This is especially true during the adjustment period. Cats require stimulation, and one of the most frequent problems with adjusting to indoor life is boredom. Provide your cat with interactive, interesting toys; feathers or fabric on a string attached to a pole, paper bags, lightweight balls are great fun for cats. Spend time playing with your cat every day, and make sure she has posts or other textured areas to scratch on and a clean litter pan. When given the option, It is also beneficial to start young cats raised indoors typically show no interest in going outside. You can find tips on converting outdoor cats to happy indoor cats from the American Bird Conservancy here, and the Humane Society of the United States here. 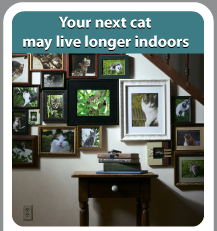 The HSUS site also has many tip sheets on resolving specific behavioural problems in indoor cats.